As a mother, there are many expenses you will have to incur if you want to give your baby the best care. On average, you will need about 30 baby wipes each day, which totals to almost a thousand every month. Think about it this. You need about five wipes for soiled bums, two for wet and several for cleaning your baby’s face and hands. Given that they come in direct contact with the skin, it’s important that you invest a product that is durable, soft and sensitive. While choosing a cheap brand may make economical sense, it’s important to note that those options tend to be thin and break in your hand during use. This results in use of more wipes than anticipated. Better quality baby wipes, though expensive, will save you plenty of money in the long run. Baby wipes come in all kinds of variations in terms of scent, refill packs, ingredients used and more. So how are you supposed to make a choice that’s right for your little one? Many do the job well, but some are faster or better at it. That said, here are a few factors to consider when shopping for baby wipes. It’s important to determine whether your baby has a super-sensitive skin. Unscented wipes will be a better choice if the baby can’t handle fragrance on their skin or diaper area. Scented baby wipes come in many variations and if the baby can handle fragrance, then the choice is ultimately a matter of personal preference. A plastic box with a flip up lid is the most common type of container used for baby wipes. The wipes pop up through the lid, making it easy to grab with one hand while changing a diaper. The best thing about pop-up containers is that you can purchase refill wipes, thus saving you the need to purchase a new plastic box each time you purchase wipes. Other containers feature a plastic bag with a rigid flip-up top. Their main advantage is that one never has to worry about refilling them. Travel baby wipe packages are available in two variations i.e. a plastic bag with a stick-type top and a rigid plastic box with some kind of opening mechanism. Many parents opt for generic products because they are cheaper. However, many brands don’t always deliver quality. Some produce baby wipes that are too thin to get the job done effectively while others produce wipes with a slippery texture that makes it difficult to clean the baby. Consider buying from a brand that offers quality products. Consumer reviews will give you a good sense of which companies offer the best baby wipes. As the name suggests, flushable wipes are specially designed for potty training toddlers. They are also useful for families that have hybrid diaper systems with flushable inserts. Like regular baby wipes, flushable wipes come in a plastic flip-top box and are sometimes available with refillable packs. Take care not to flash too many wipes at a time and keep in mind that your plumbing bill will be quite expensive if the septic system can’t handle thick wipes. This is a newcomer to the baby product scene that was launched in April 2016. Its super thick and cloth-like nature makes it a good contender in terms of performance and durability. The wipes are made using 60gsm material and come in four packs, each with 72 wipes. Their PETA cruelty free and hypoallergenic nature makes them a great option for babies with extremely sensitive skin. The ingredients used i.e. vitamin E, cucumber and organic aloe vera nourish the baby’s skin. Parasol baby wipes are suitable for cleaning of hands and face, baby weaning as well as changing diapers. If you are on the market for something that gets the job done while saving you some money, Pampers Sensitive Wipes make a great choice. It is pretty cheap compared to similar products. The absence of a fragrance means that you don’t have to worry about a stink. Pampers Sensitive Wipes are also wet, soft and durable. They don’t rip and help clean your baby. While they aren’t 100% natural like other products on this list, the trade off is that they don’t contain harmful ingredients and are cheap. Babyganics is a brand loved by mothers who are prefer things all natural when it comes to their babies. Their baby wipes are incredibly effective and fragrance-free. They are a good investment if your baby’s bottom is prone to diaper rash and you don’t want to worry about irritation or burning sensation. These wipes aren’t USDA organic, but you can take comfort in the fact that most of the ingredients are natural. Some of them include Neo Nourish Seed Oil Blend, sunflower, tomato, red raspberry, black cumin and cranberry. All of the above ingredients play a vital role when it comes to cleaning and nourishing a baby’s skin. An additional advantage of these wipes is that they are biodegradable, which cannot be said for most. They also double as tissues, making them ideal for cleaning the hands, face and feet. These are 100% natural wipes whose premium price is worth paying to ensure the safety of your baby. In addition, you will have the peace mind knowing that Seventh Generation is a brand that doesn’t disappoint its customers when it comes to quality, eco-friendly baby products. These wipes are particularly thick, making them ideal for messy cleanups. They don’t contain substances like phthalates, dyes, alcohol, fragrances and parabens that could harm your little one. One of the materials used is wood pulp, and this gives them strong and sustainable nature. You will love the fact that these wipes are sold in a resealable pack and as such, you can sign up for a subscription and save yourself some money. For a relatively new product, these wipes perform really well. They are marketed as high transparency for ingredients and ingredient sourcing. Elements wipes are made up of up to 98% purified water as well as chamomile extract, both of which do a good job of soothing the skin. They have two cleansers, one that’s unnatural and another that’s derived from coconut. The PH balancers are good for the skin, but not all parents like that one of the preservatives used is phenoxyethanol. This is because the preservative has been known to cause irritation. You will love that these wipes don’t contain any alcohol, phthalates, dyes or other harmful ingredients. The fragrance-free nature is good for babies with particularly sensitive skin. Every package has a unique QR code that you can use to scan and get the ingredient list. 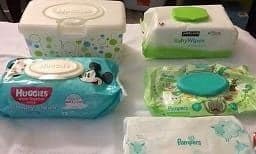 When it comes to diaper changing supplies, it’s important to note that you may have to experiment with a few choices before finding just the right wipes. The good news is that once you do, you will have peace of mind knowing that your baby is well taken care of. We would recommend choosing products that are 100% natural, or contain a lot of natural ingredients. These are free of harmful chemicals and good for the baby’s sensitive skin.